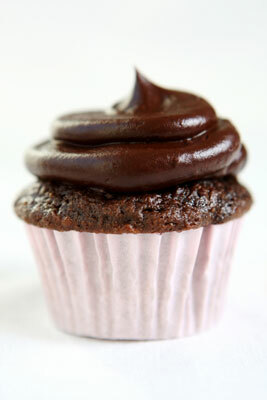 The coconut oil in this creamy gluten-free chocolate frosting gives the frosting a satiny texture. Add more cocoa powder if you like a deeper chocolate taste. Coconut oil is solid at room temperature; in fact, it’s so solid that it’s difficult to combine with the butter unless both are melted together. In a large saucepan, combine the coconut oil, butter, and chocolate chips. Melt over low heat until smooth, stirring frequently, about 3 to 5 minutes. Remove from the heat and beat in the cocoa powder and salt. In a small bowl, combine the heavy cream, sour cream, and vanilla; whisk to combine. Alternately add the powdered sugar and cream mixture to the melted chocolate mixture, beating well after each addition. You may need to add more heavy cream or more powdered sugar for desired spreading consistency. This recipe fills and frosts one 9-inch layer cake. Per 1 tablespoon serving: Calories 82 (From Fat 40); Fat 4g (Saturated 3g); Cholesterol 8mg; Sodium 5mg; Carbohydrate 11g; Dietary Fiber 0g; Protein 0g.